I have often thought about the phrase the Pope used to describe disparity: “The powerful feed on the powerless”. 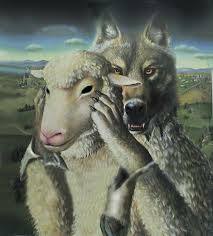 My thoughts usually go down the path of the American public are sheep that are preyed on by wolves. The “powerless public” does not stand a chance against the “powerful business and political interests” who run this country. There are two ironies. Our money and votes make it all possible, but as the Pope said we are still the powerless majority. See William Cohan’s article ‘Pope Francis 1, Wall Street 0’. If the Pope represents God’s interests and the powerful represent the devil’s interests, I would have to say the devil is winning. The devil’s disciples almost caused a Great Depression a few years ago. Millions of people still suffer from the greed and corruption that made the devils’ $100 million Park Avenue penthouses possible. What is the difference between a Columbian drug lord and a Wall Street executive? Not much. They both feed on the public. They are both willing to sell toxic products to make money. They both reap billions in profit. They both live in penthouse apartments. They both travel in private jets. And, they both could care less how much damage they do. They have very few consequences because they are protected by the Devil, with a capital “D” that lives in Washington. Corrupt politicians make it all possible and the powerless public does not seem to care.